I wasn’t surprised when I next visited our Tucson Catholic Community Services (CCS) website to see the plea for volunteers needed that day to help prepare hotel space being provided on an emergency basis by the Church. So many responded! With less than 24 hours notice from ICE requesting that up to 100 migrants be received by CCS, parish groups and volunteers were alerted and help was provided to welcome and meet the immediate needs of the families, mainly women and children, being dropped off into our care. Needless to say, my day took a very different twist as I found myself volunteering at the motel in South Tucson where 35 rooms had been reserved by CCS to address this emergency need. Supplies needed to be unpacked, backpacks needed to be filled with basic supplies (throw-blankets, toiletry supplies, snack items), motel rooms had to be prepared as medical/hospitality stations. ICE vans began delivering the migrants that afternoon. See one Guatemalan mother with her four children in the photo below—a photo that is a sample of the many who were delivered—all needing the warmth and touch of human kindness on the arduous journey they were on. My Saturday was blessed and became a holy Advent day of welcoming…helping…responding to the basic needs of others. A Guatemalan mother and children, refugees needing Alitas assistance. 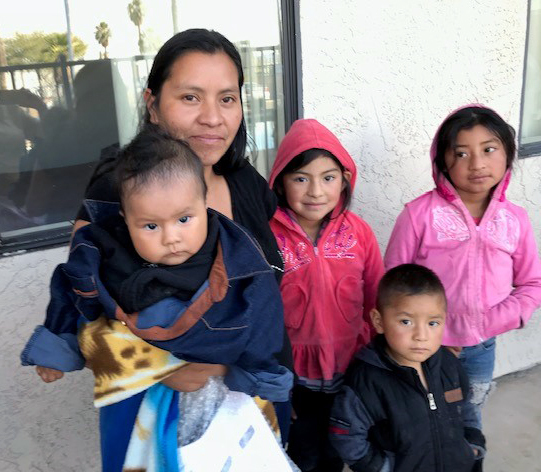 In Tucson, Arizona, Catholic Community Services (CCS) provide direct assistance to migrants through the generosity of parish/diocesan funds, donations, and many willing volunteers who help in receiving and addressing the needs of immigrants. In the last few years, with the sad but real growing unfriendliness to refugees seeking a better life in the United States, the plight of migrants has escalated greatly. Many of the services CCS provide happen in a simple neighborhood within the walls of a little home owned and operated by CCS—Casa Alitas. This home can accommodate up to 18 people, but the larger “delivery” of 100+ migrants that Saturday before Christmas necessitated extra space—a hotel rental. “Casa Alitas” is Spanish for “House of Little Wings,” and the spiritual and temporal lift provided by “the wings” of Casa Alitas to displaced migrants is life-giving! Those welcomed for short-term stays have gone through our government’s process for seeking asylum in the United States. On their difficult and often dangerous journey of escape from violent and abusive situations in their homelands (mainly Central America and Mexico), the migrants are interviewed at the border by the Immigration and Customs Enforcement and are then delivered by ICE to places of temporary refuge sponsored by Church and humanitarian groups. Casa Alitas is one such welcoming place. All who arrive there have court order dates for an asylum hearing in U.S. cities where they have identified friends/family who await their arrival. In the interim time, from the border to their families, the immigrants need shelter, food, clothing, medical check-ups, assistance with their court orders from ICE, travel vouchers, transportation to the bus depot for their trip to places where families await them. Casa Alitas does all that along with offering the spiritual “lift” that a welcoming environment provides. Two Dominican Sisters of Mission San Jose, Sisters Angelica Velez and Mary Virginia Leach, minister at the University of Arizona Newman Center in Tucson. In any time they can take away from Newman Center, they give volunteer service in different ways to assist at Casa Alitas. Other MSJ Dominicans, especially those who are Spanish-speaking, have been invited to come for short periods of volunteer service at the site to work with the migrant families. During her Christmas break from teaching in San Francisco, California, Sister Dulce Aguilar-Rodriguez gave five days of ministry at Alitas. Sister Veronica Esparza-Ramirez, a member of the MSJ Leadership Team, has also visited Alitas while in Tucson, and the Congregation has provided financial contributions to the Casa. Sister Angelica works with students from UA Newman Center to regularly provide meals a few times each month to migrants at the Nogales border through the Jesuit Kino Border Initiative. Newman sponsors ongoing collections of donations for Casa Alitas through their Social Justice ministry. Prayer for God’s guidance and help in responding as Jesus would to this complicated immigration situation is always needed! What basic, simple human needs beg to be met? What do the faces, especially the eyes, of the migrants communicate? How can we replace fear with trust through conversations, smiles, words of welcome? Little things go a long way! Thank you for your support and prayers! If you are inclined, monetary donations for Casa Alitas may be sent to: Catholic Community Services/140 W. Speedway Blvd. Suite 130/Tucson, Az. 85705/Casa Alitas: alitas@ccs-soaz.org.